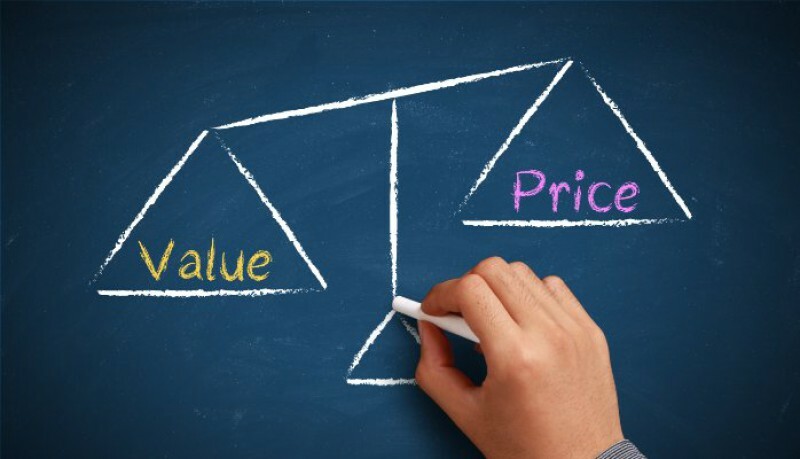 Implementing value based pricing is the easiest part, implementing a value strategy is another thing. 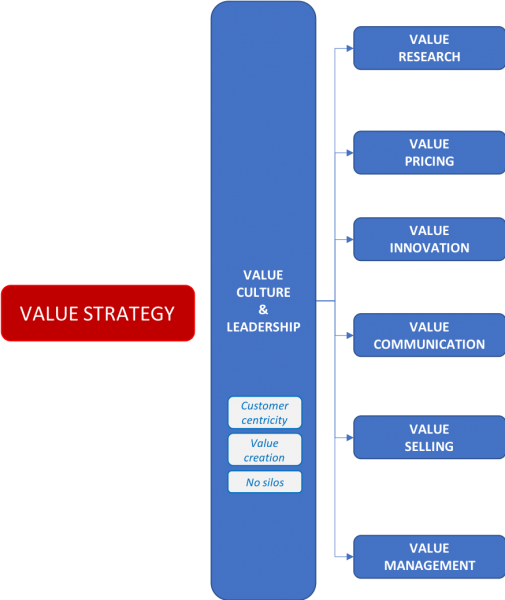 If you price on value ; you will need to invest to communicate your value, to sell and defend your value, and use your value researcg insights into value innovation. In other words, you have chosen to install a value strategy. We help implement your value strategy by defining your roadmap, setting the priorities, defining your projects, engaging your key ambassadors - and really make it happen ! Of course the roadmap takes care of the speed and focus you want and in alignment with your corporate strategy projects. Launching succesfull innovations never happen in a vacuum or in silos. Understand price premium value drivers within your (micro) segments, price elasticity, and price perception are crucial elements in the mix. On top of that, how your price has become as important as what you price : new pricing models therefore have a crucial impact on your market succes and profitability. Our consultants have proven business success in supporting your innovation teams to capture your value creation and get a fair part of it. Organisations are changing fast into digital enterprises. IoT, digital tagging and data collection create massive new value - and capturing the value of digital is almost always a challenge. Our consultants are seasoned experts and accelerate your process and generate solid revenue streams and profitability for your digital innovations. Subscription based pricing models are game-changers ; implementing profitable subscription based business models is more challenging than ever. Our consultants help you to avoid the classic pittfalls and accelerate the development of your subscripton based pricing plans - and the management of your subscripton business (KPI's, dashboards). VC also helps in developing your profit playbooks how to monetize your business. Many organisations struggle to make their business profitalble dispite solid revenue growth. Sounds familiar ? Our experienced consultants help you to develop a step-by-step roadmap to develop a profitable business model. Think i.e. digital media ; what will be the launch proposition ? when to add new functionalities and new features ? at what volume do we need to switch the pricing policy ? Or think i.e. digital transformations ; how to move from your classic channel partners to a new channel strategy to capture the value of your digital services ? How and when to convert your customers to the digital ? etc. We help. Our starting point in organisations is often in market strategy and/or pricing. But sometimes the solution is not in the market strategy or pricing. When the real challenge is in the corporate strategy, we support organisations in reflecting on what made them excel and if the strategic drivers that made them excel in the past will remain the same drivers to ensure future success. We have a strategy process that helps management teams reflect on their future strategic drivers (how to outcompete competition) - and their future areas of excellence (where we need the money in and focus on). If your competitors are the first thing you think about when you wake up in the morning - and the last thing on your mind in the evening ; you have a me-too strategy and it is not working. By defining your future strategic drivers and areas of excellence you create a competitve differentiation to outperform your competition. Of course the most important question to be answered in strategy is ; what business do you want to be in (your sandbox). Your next question to be answered is how to outperform your competitors in your sandbox. The ultimate strategy is one that makes competitors irrelevant. It ‘s not about good management, but about the 5% you do differently. That's what is called Strategic Leadership. The organisation was integrated in a multinational concern and needed a new market strategy. The segmentation and positioning was outdated - and product innovation and value communication to DMU needed improvement. After the new investors privatised the company and realised a succesful transformation path - thanks to important investments in operations and implementation of a new global sales organisation - the production facilities were reaching full capacity again. This triggered a new phase for the organisation, switching from a volume strategy to a value/profit strategy. This new strategic path required a new market and pricing approach, with a focus on high added value applications to yield on every ton of the available capacity. Managers in strong and poor performing companies are doing for 95% identically the same things. This is what we use to call ‘GOOD MANAGEMENT’. But good management is not what we talk about here to outperform yoru competitors. It ‘s about the other 5% that you do differently*. This is about ‘STRATEGIC LEADERSHIP’. --- * If 5% sounds too little to you, remember that human beings and chimpanzees are 98 % identical in their genetic makeup. Developing your pricing maturity is not just a project, it‘s a journey and change process. It takes time and requires efforts, but is very rewarding - and yes, there is a proven path towards pricing excellence ! The main learning after 15+ years of succesful pricing projects : it's important to do the right thing right - at the right moment. This Thougth Leadership Paper gives you a concrete step-by-step approach to lead you to pricing excellence !